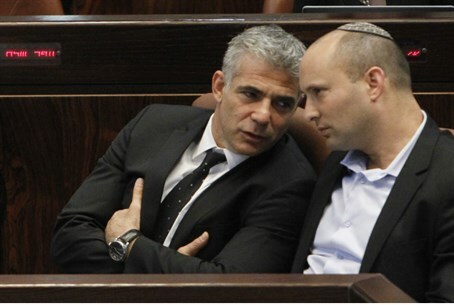 In contrast to Jewish Home MK's attack on 'Comrade Lapid's' threats against Chief Rabbinate, Bennett notably silent. Finance Minister Yair Lapid's threats on Facebook to fire Chief Ashkenazi Rabbi David Lau and Chief Sephardic Rabbi Yitzhak Yosef, after the Chief Rabbinate made a halachic (Jewish legal) ruling against female enlistment in the IDF, have elicited a wave of criticism. "It is insolent and a national scandal, and we will act to have them dismissed, both in the Knesset and in the government and even in the legal sphere if need be,” fumed Lapid on Facebook last Friday. The outburst has been harshly criticized by some. Hareidi-religious MKs accuse Lapid of megalomania and tyranny, the head of the Bnei Akiva yeshivas Rabbi Haim Druckman called the threats "first class chutzpah," adding that Israel is not communist Russia, and MK Yoni Chetboun (Jewish Home) demanded an apology. Meanwhile Chetboun on Sunday made additional criticism of Lapid's threats. "We don’t live in the Soviet Union," noted Chetboun. "Comrade Lapid loves trumpeting that we must live in a Jewish and democratic state, but it seems when a rabbi expresses ‘the wrong opinion,’ the halachic process and freedom of speech can go out the window." The Jewish Home MK added his criticism of the Chief Rabbis to his criticism of Lapid. “No one denies that the Chief Rabbinate needs to be seriously reformed. But threatening to dismiss public officials for expressing an opinion? I didn’t realize Torquemada was back in vogue," quipped Chetboun, referencing a brutal leader of the Spanish Inquisition. During the discussion in which the Chief Rabbinate's ruling was made, Rabbi Shmuel Eliyahu, the Chief Rabbi of Tzfat, warned that the drafting of women to the IDF threatened "to erase the identity of Israel as a Jewish state." In late December, Rabbi Yaakov Ariel, the Chief Rabbi of Ramat Gan, similarly opposed having women in combat roles, promoting national service instead. "Women and men cannot serve together in the field in combat – it is dangerous to security, a moral risk, the Torah opposes it, common sense is against it,” argued Rabbi Ariel, adding “not through coercion…let them find ways through volunteering. Enlisting women to the army is forbidden."